Chuzzle Slots - Review & Play for FREE NOW! 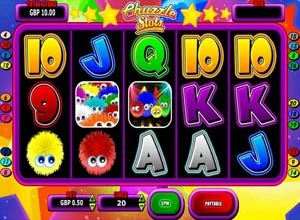 Step 1: Bets vary in Chuzzle Slots from 0.01 to 10.00 per line and can be altered by clicking on the stake up and down arrows at the bottom of the screen. Step 2: With a possible twenty pay lines to choose from, you'll need to choose how many you wish to have in this Chuzzle Slots game by clicking on the pay lines button. Step 3: Clicking on the green button will spin the reels for your first game to begin. Chuzzles are very reminiscent to those little sticky furry monsters all the kids had stuck to their windows, tables and chairs in the nineteen nineties, so it is no wonder then that most people will instantly feel a connection with these loveable creatures. Chuzzle Slots is no doubt themed after them, and the cute, cuddly and adorable fur-balls only add the games appeal. The Chuzzle Slot machine game contains five reels and twenty five pay lines and a whole range of hilarious squeaky sound effects. The wild card is represented by a multi-coloured Chuzzle, and if five of these are bagged, the big jackpot is yours to be had. Five or the red or blue coloured Chuzzles will see a player up by the next highest amount with five yellow Chuzzles below this. Anything else a player picks up with high card symbols is worth a paltry some in comparison. Chuzzle Slots also has three types of scatter cards in play for you to come across whilst spinning. There are Chuzzle Reaction, Chuzzle Disco and Pick A Win scatters spread throughout the game for you. In the Chuzzle Slots game a Chuzzle Disco will offer players free spins, whilst bagging a Pick A Win scatter symbol will see a player offered a choice of bottles, each one containing a different win multiplier inside. As for the Chuzzle Reaction? This is your bonus game. The Chuzzle Slots bonus game, Chuzzle Reaction requires players to connect three or more Chuzzles either horizontally or vertically to win a specific multiplication of their original wager and a fresh win. The Chuzzle Slots slot machine game isn't complicated and is very childlike so more experienced and professional slots players may not appreciate its subtleties. However, for fresh new gamers, this is an excellent game to warm up on before you go into the big leagues!